What’s the Project? These chocolate peppermint cookies not only taste great, but they also look festive and fun for Christmas with crushed candy cane on them! Easy to make and they taste amazing! Christmas is just around the corner and if you are like me, you will be in the kitchen a LOT in the next month. 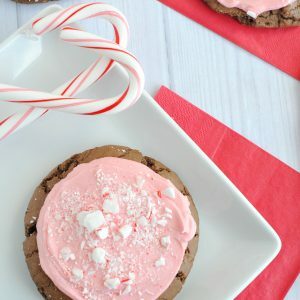 These chocolate peppermint cookies are a twist on an old family favorite for me and I love how they turned out. It’s a soft, chewy, subtle chocolate cookie topped with peppermint frosting and sprinkled with crushed candy canes, which is why I am calling them Candy Cane Cookies. Plus, they look fun and festive right?! 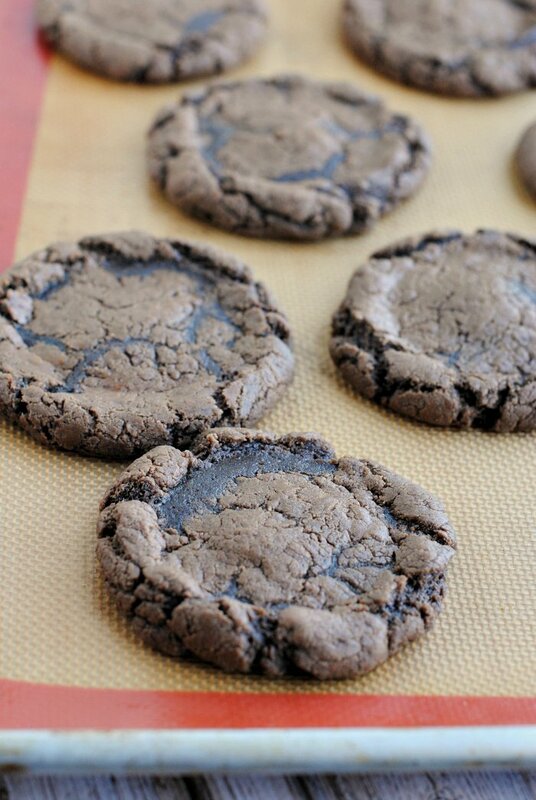 I seriously love these cookies and can’t want to make them again and again. Do you want to make them too? Let’s do it! 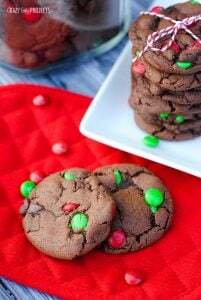 These chocolate peppermint cookies not only taste great, but they also look festive and fun for Christmas with crushed candy cane on them! Easy to make and they taste amazing! Sift dry ingredients together and set them aside. In a large pan on the stove over medium-high heat, melt your brown sugar, water, and margarine together and stir and continue to heat until it boils. Remove from heat and immediately stir in your Nestle’s Semi-Sweet Chocolate Chips. Mix until melted. Beat your eggs with a fork and then stir them into the chocolate mixture. Add the dry ingredients and stir them in with a fork until completely combined. If your dough seems runny (and like you can’t make blobs with it) add a little bit more flour. 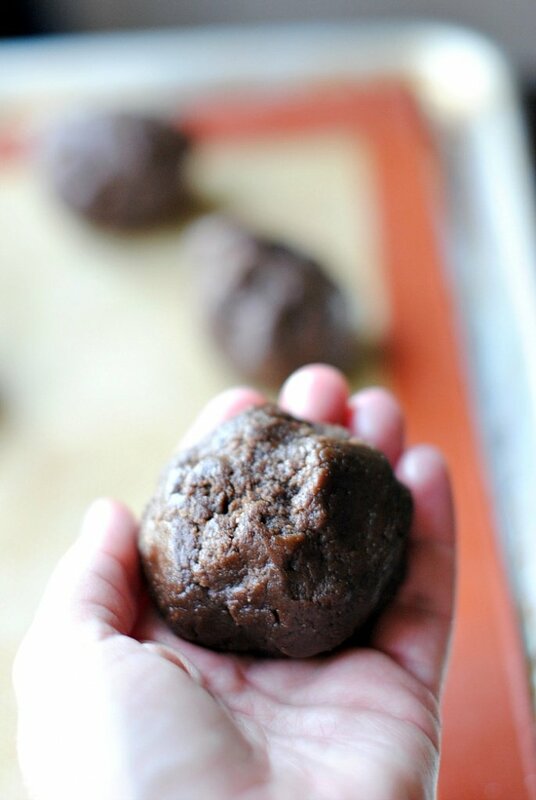 Roll into large balls (see image below) and drop onto a cookie sheet (preferably with a Silpat mat). If you don’t have a Silpat mat make sure you have a greased cookie sheet. Bake for about 10-11 minutes. While they bake you can make your caramel sauce and frosting. Scroll down for that recipe. Combine above ingredients until smooth. Pipe onto cookies with a Ziploc bag with a corner snipped off. Then spread frosting with a knife. Sprinkle top with crushed candy canes. And enjoy! 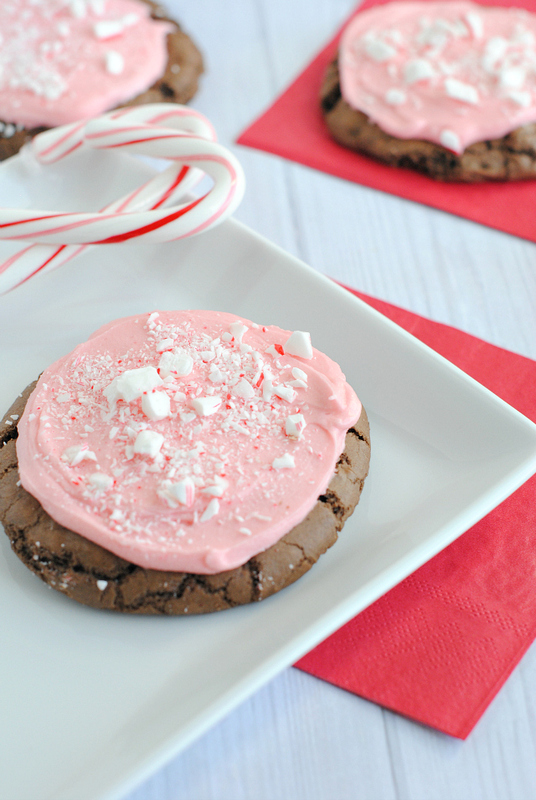 I hope you love these chocolate peppermint cookies for Christmas! Hi Amber! I admire the simplicity and beauty of this recipe. I love baking, too. I will try your recipe. This is just timely for the upcoming holiday. Not sure what you are asking? This recipe looks great! 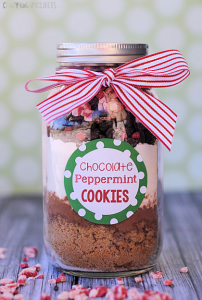 I will be making these with my daughter this weekend to test-taste for our holiday party, I bet they will be a hit! 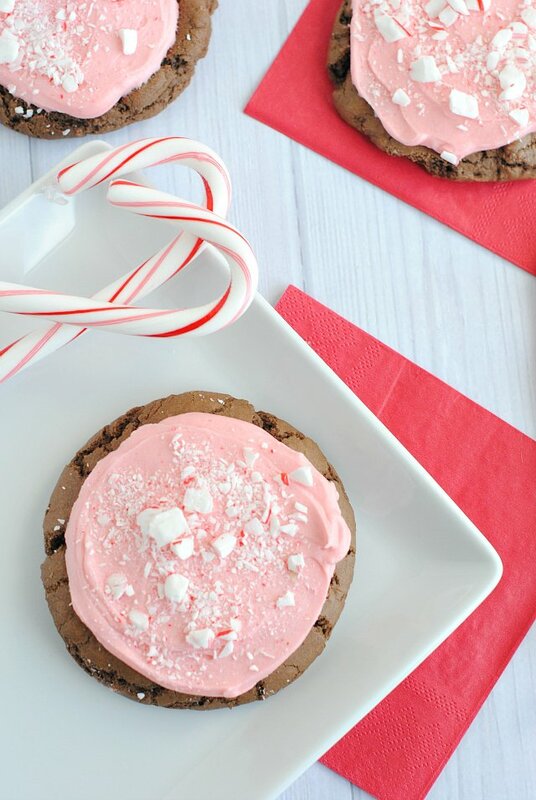 in candy cane kiss cookies . can I use semi-sweet in place of dark chocolate chips in the recipe? I totally missed that part! Making those cookies tomorrow, thanks! Yes, semi sweet is what I use. How many cookies does this recipe make? these look yummy! 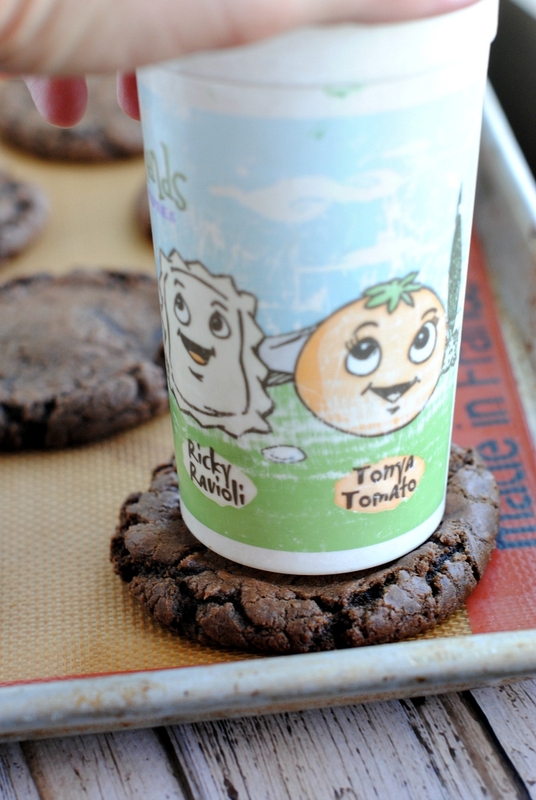 The pictures look as though these cookies have cocoa powder but it isn’t in the list?? Nope, they have chocolate chips instead. The recipe clearly States to mix in choc chips til melted. There is no coco powder, idk why people get so confused. OP- great cookies, thank you! You said, “While they bake you can make your caramel sauce and frosting. ”. Was that just an error or did I miss something? Your recipe says, while the cookies bake prepare the caramel and peppermint frosting. I don’t see caramel on the cookies nor do I see a recipe for it…just see the peppermint frosting. ??? Is it possible to use non-dairy products to replace the butter? Have you experienced the change Nestle has made in their chocolate and butterscotch chips. They do not melt well nor do the butterscotch chips look or taste the same as they did before Nestle went “healthy” with their product? What brand do you use if that can be revealed in this forum? I’ve heard that but haven’t noticed the problem?